Chop Tomato and Capsicum roughly into pieces. Heat oil in a pan, when hot add Urad Dhal. When it changes its color, add the red chilly and garlic cloves. Fry till they turn slightly brown. Now add chopped tomatoes. Fry till the oil separates. Add chopped capsicum pieces. Mix well. Fry for few minutes and then add grated coconut. Fry for few more minutes until done. Set aside to cool. Add Salt and grind it along with tamarind. Heat oil in a pan. When hot, add Mustard seeds. When it starts popping up, add Urad Dhal and curry leaves. Fry till they slightly change their color. Pour this tempering over the chutney. Add water till it reaches desired consistency. Notes: This is really hot. So add more tomatoes if you are looking for a less hot chutney. This goes to Vegan Thursdays. 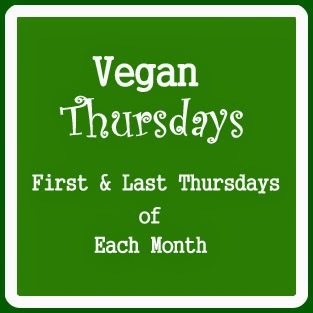 We share only vegan recipes first and last thursdays of every month. super yummy and nice chutney...perfect with some hot idlis! Lovely chutney! What a lovely blog you have! Happy to follow you! I love capsicum :) Have tried chutney with it many times I know how flavorful it will be.. Delectable clicks!